Mild spoilers for The Dark Knight Rises below. 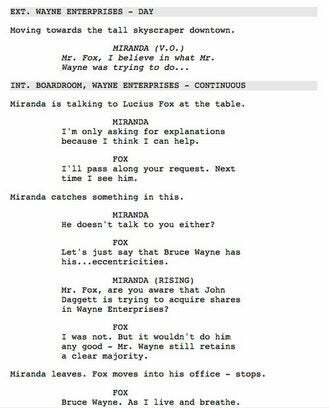 Now that The Dark Knight Rises has hit theaters and all of they key plot beats are out of the bag, big chunks of material is starting to hit the Internet that otherwise would not have. Among those are a script page for a deleted scene that was apparently never filmed (or at least not included) in the final version of the movie, concept art that shows how the design artists struggled with bringing Bane to the screen, and a spoilery photo that at least one actor is very glad didn't get out before the film's release. 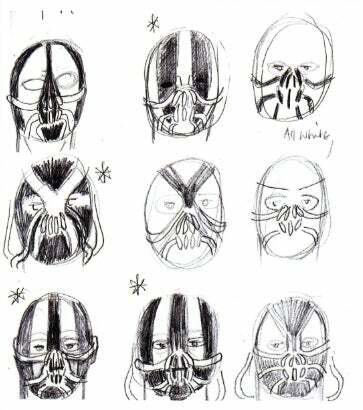 In the image at left, it's clear that the concept artists are trying to work out a "look" that works for Bane's mask, with early sketches seemingly trying to incorporate more of his comic book look, with the lucha libre mask and all. That look made it into Joel Schumacher's Batman & Robin, but since everything else about the character was horribly mishandled, they likely looked at the film and said, "Well, that won't work." The appearance they ultimately went with, somewhat similar to the image in the middle, ended up pleasing most fans while still others just couldn't understand what was wrong with the comics look to begin with. We also get a handful of photos from on the set, including the "photos of people filming" that tend to come out in the making-of books and featurettes. These include some great shots of the fight scenes between Batman and Bane that I hadn't seen before, including the first and only shot I've seen released publicly in which Batman appears to be holding his own in the fight. There's also an image of Scarecrow, something that actor Cillian Murphy would have deeply disapproved of, had it come out earlier. A couple of days ago, meanwhile, Comic Book Movieuncovered the image at left, which appears in the book The Dark Knight Trilogy: The Complete Screenplays with Storyboards, which will hit the stores in August. 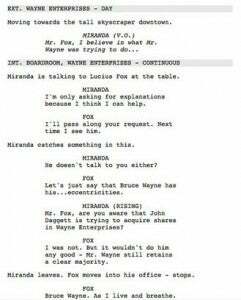 In it, Nolan includes scenes that were in the original screenplays but never shot, including this one from The Dark Knight Rises, in which Lucius Fox and Miranda Tate discuss attempts by John Daggett to take over Wayne Enterprises. Certainly it wasn't key to the story in any meaningful way, as the Daggett subplot played itself out quickly and effectively without this bit, but it's always interesting to see what could have been.